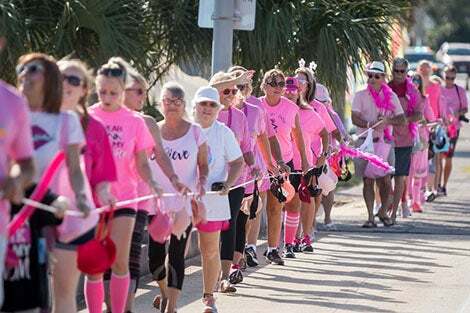 PENSACOLA, Fla. (Oct. 19, 2018) – The ninth annual Bras Across the Bridge raised more than $36,000 for Baptist Health Care Foundation’s Mammogram Fund – a $10,000 increase from last year’s event. The Mammogram Fund provides mammograms to women in our community who are not financially able to afford one on their own, as well as raises awareness and support for early detection. For every $100 raised through the Foundation, one mammogram can be provided to a woman in need. Since the beginning of this program, mammogram screenings have been provided to 2,006 women. As a result of these screenings, 391 women required additional testing, 47 required biopsies and 18 were diagnosed with breast cancer. More than 400 new bras were donated by Bras Across the Bridge participants. The Foundation will donate these bras to several local organizations that help women and girls in need. Baptist Health Care Foundation would like to thank the following sponsors: Pensacola Honda; The Grand Marlin Restaurant & Oyster Bar; Soft Rock 94.1; Magic 106.1; Nash 102.7; WEAR ABC3 - WFGX 35; Pensacola News Journal & Bella Magazine; Acumen Medical Imaging & Interventional; Andrews Institute Rehabilitation – Crestview; ASI Endurance; Cox; Fisher Cabinet; GoodWin Asset Management; Gulf Power; PPX Imaging, Inc.; Tickled Pink Club; Wind Creek Casino & Hotel – Atmore, Alabama; Ben Brown, M.D. Plastic and Reconstructive Surgery; Liberty Sertoma; Life Care Center of Pensacola; Medco; MoxieFood.com; and ResortQuest by Wyndham Vacation Rentals. For more information or to make a donation to this cause, contact foundation@bhcpns.org or 850.469.7906 or visit BaptistHealthCareFoundation.org. For more information about this press release or to schedule an interview, please contact 850.791.5254 or BHCMediaRelations@bhcpns.org.